An eye-catching Austin Mini Cooper Recreation built by a motoring fanatic. Bumper overriders, black wheel-arch extensions, black door mirrors, bonnet and boot strap, headlamp covers, Lucus 576 spot and fog lamps, Lucas rear fog lamp, Lucus reverse lamp, FIAMM air horns, twin Smiths stopwatches, Brantz International 2 Pro + Rally timer with remote, Smiths Tachometer, Pea light, JJC Lifeline fire extinguisher, battery cut-out switch, Moto Lita steering wheel, fresh air heater, oil pressure gauge, water temperature gauge, hazard lights, interior light. 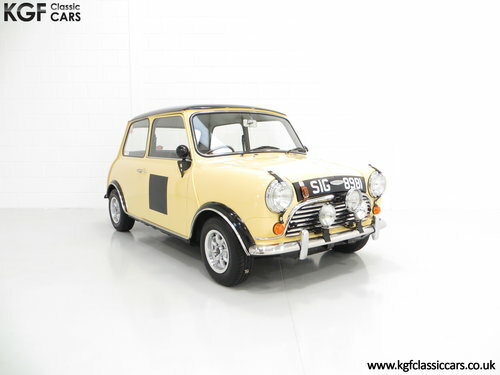 This stunning re-creation of an Austin Mini Cooper Rally car is finished in Austin Yellow and Gloss Black (Code FAP /668). Meticulous attention to detail can be seen in everything from original Lucus lamps to the Mk1 grille and surround. Fabulous accessories such as the black lightweight aluminium door mirrors and brackets, competition petrol filler cap, perspex headlamp covers and wheel-arch extensions set this car apart from the crowd. 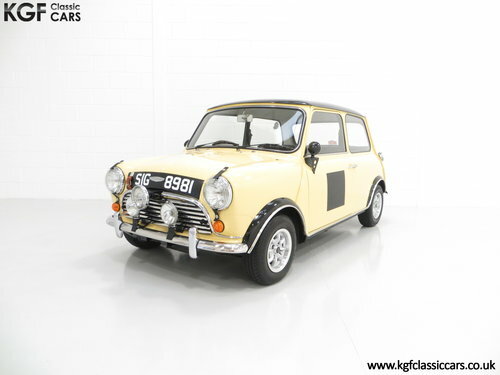 Neat touches such as the Austin Cooper bonnet badge, centre fixing Rangefinder spot lamp and door number squares will please visual spectators. Presented in excellent condition with Motip Anti Rust waxoil and fully detailed. A splendid show piece. 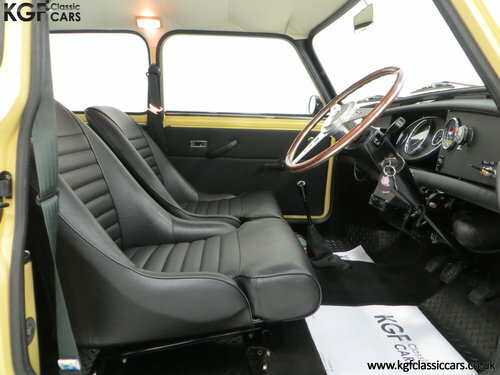 A no expense spared mentality is clearly visible with the interior to enhance the rally format. An accurate replica of the 60’s Microcell Contour rally seats supplied by Derek Taylor of Classic Porsche and the black crackle finish rally dash panels look tremendous. An original Mk1 oval centre consol is supplemented by beautiful period gauges such as rare twin Smiths stopwatches on a silver baseplate and a Smiths tachometer. A working Brantz rally timer with an adjacent remote control facility combined with a fully refurbished Moto Lita woodrim steering wheel and Mk 1 gear knob mix old and new harmoniously. All carpeting is protected by hardwearing rubber over mats and spotlessly clean along with the door cards and headlining. A Mk1 style plywood carpeted boot board made by Brian Purves has attached a scissor jack and wheel brace. A delightful period 60’s rally cockpit. The time proven 998cc ’A’ Series engine is presented in an immaculate engine bay and benefits from a Stage 1 engine kit comprising of a Maniflow Cooper Freeflow exhaust manifold and a Torquemaster inlet manifold breathing through a RC40 twin exhaust box. The 1.5 SU carb was rebuilt, re-jetted and needled and electric ignition fitted with a U.S Flamethrower coil and a new set of Bumblebee HT leads with NGK caps and NGK plugs. A competition water pump and and alternator were fitted and the vehicle was set up by CCK Historics where the rolling road took it to a comfortable 57bhp. Beautiful attention to detail can be seen with the correct BMC EP3A green engine paint being used and even a new aluminium Austin badges being riveted to the rocker cover. The 4-speed synchromesh is smooth, light and precise. A real joy. This super little car sits on 10 inch Minator alloy wheels with Dunlop wheel centres shod in Kumho 145/80 R10 tyres. All have excellent tread with no damage to the alloy and the car has been tracked and aligned by Classic Cars of Worthing. Hydraulically operated front disc brakes and drums to the rear. 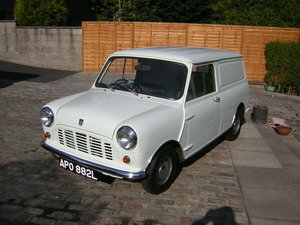 The current owner and creator of this delightful Mini Cooper Recreation is Roy Parmenter. An absolute motoring fanatic and at the age of 76 years has even published a book featuring all the cars he has owned. With cars such as an Aston Martin DB5, Carrera Panamerica Porsche 356 and ’36 Le Mans MG PB it is great to see this latest personal indulgence featured. 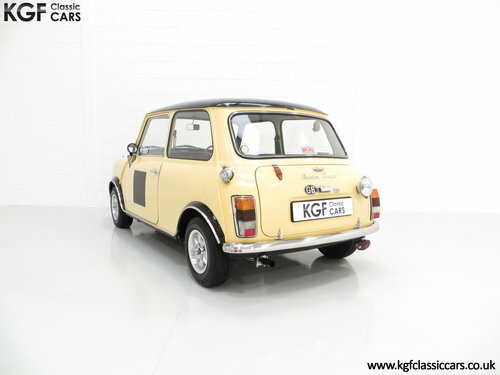 Registered new on the 21st October 1982 as a humble Mini City, Roy purchased the car from Richard Williams of Devon for a large sum of money due to its fantastic structural and low mileage credentials. Bizarrely after paying such a large sum of money the intention was to always build a vanity project, namely a Austin Mini Cooper Recreation. 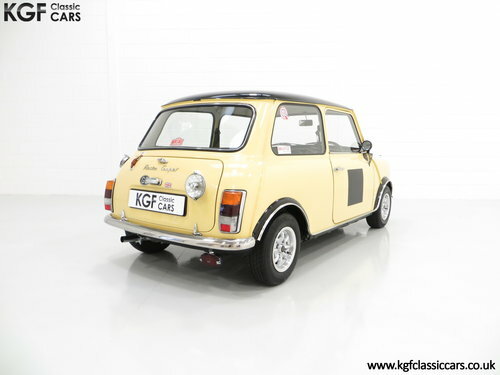 This was done over a two year period to a fantastic build specification and thorough knowledge thanks to Roy having owned a number of original Mini Coopers over the years! A file of invoices, costings and a personal written account with leave no doubt in the next owners mind how meticulous Roy is. With the original 1960’s Austin Mini Cooper Mk1 an icon of the British motoring history and as such fine examples can command figures in excess of £40k and the ‘S’ equivalent far more, this recreation is a combination of improved engineering expertise with 60’s elements that represents a rare opportunity to acquire a truly remarkable one off.